I confess, I must be the laziest dyer around. If there is a shortcut to do anything, I MUST find it. There are thousands of books on dyeing available so why am I showing you my process? Because it is easier and that is REASON ENOUGH. Here's how I do it. #1 Wear rubber gloves. 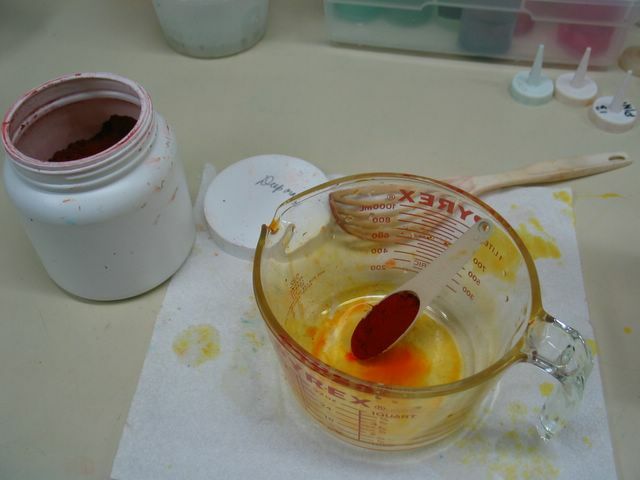 Using regular household utensils measure a tablespoon of dye powder into a measuring cup. #2 Add plain water to just cover the dye powder. Notice the paper towel under the Pyrex. It is damp and the dye dust will cling to it, making clean up easier. #3 Stir until dissolved. ...................................................#4 Add more water. I am mixing this dye powder with about two cups of water per tablespoon. This holds true for all the colors I use with the exception of fuchsia which is so intense that I am only using ONE TEASPOON per 16oz of water. 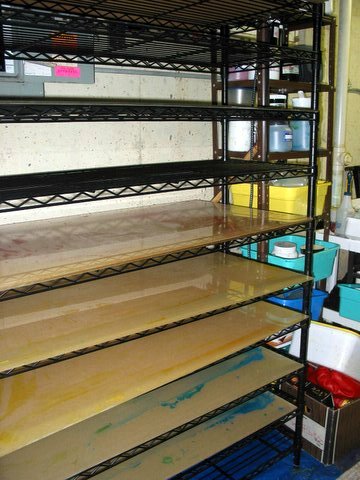 Store mixed dye solution in plastic squirt bottles, or small plastic storage containers. It lasts less than a week at room temperatures, so either mix small amounts or use it up quickly. I like to use squirt bottles which hold a cup or 8oz of liquid. 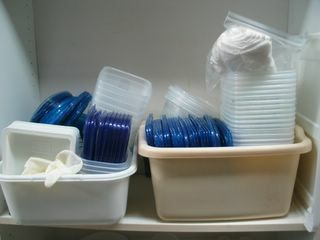 I also like the 'disposable' plastic containers like Gladware or some such generic brand. I buy them in various sizes and they store so neatly in my dishpans. 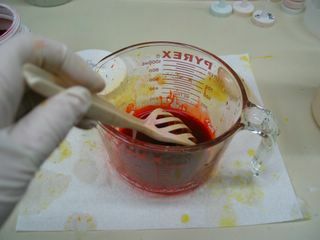 The dishpans are very useful for mixing dye into fabric to get a solid color. I pre-soak all my fabric in a large Rubbermaid container filled with soda ash or sodium carbonate (same thing) and plain water. How much water to soda ash you ask? To a gallon of water I mix in 1/4 cup soda ash. But don't quote me on that. I just sprinkle more soda ash every time I add water to my container. The fabric is soaked just long enough to get thoroughly wet and then I put it in my washer SET ON SPIN CYCLE and run it long enough to get rid of most of the wetness. Then it is ready to dye. (of course you are only using PREPARED FOR DYEING fabrics). If your washer doesn't do this, just wring out the fabrics so they are not sopping wet. All of those are from Dharma Trading Company. I also order my acid dyes for yarn from Dharma. I use only procion dyes on my silk and don't change a thing in my formulaes when I dye the silk. I treat it exactly the same as cotton, all the way through the process and into the fusing. NOTHING IS DIFFERENT FOR THE SILK. Really. 400 M Bleached Desized Mercerized Cotton Print Cloth (78 x 76) from Testfabrics. I have used this fabric for decades. Always works great. Expensive but worth it. Mercerized Cotton Print Cloth and Economy Muslin both from Dharma. The economy muslin will have to be prewashed, even if it says PFD. Mercerized Print cloth from Dharma, and all their fabrics, silks, hemp, muslins etc. are all pfd. While I love the look of sateen, it is a twill weave and therefore when used raw edge, the threads stick up quickly at the edge and that does not make me happy. So instead I use a plain weave silk. It turns out the silk is less expensive anyway, so there. I get my soda ash from the swimming pool supply place and pre-soak all my fabrics first. 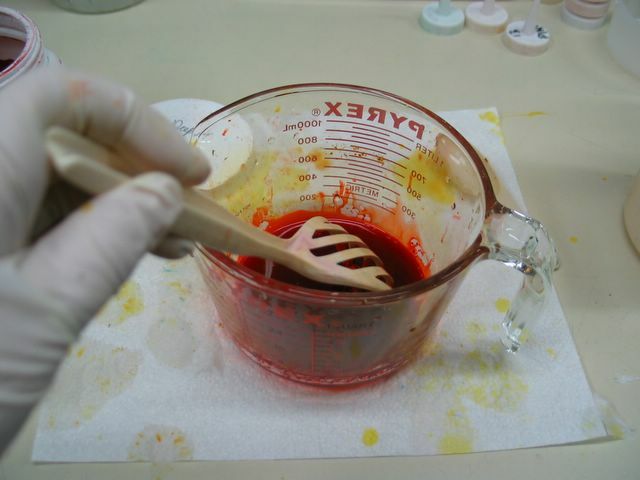 Using a dishpan, pour in a cup of dye solution. Add fabric (wear your rubber gloves!!) and squeeze the dye into the fabric, wring it out and repeat until you are certain that all the dye is evenly distributed. How much fabric will one cup of solution dye? Start with one damp yard, PRE-SOAKED IN SODA ASH SOLUTION. If you want to do a smaller amount use less dye solution. There will be leftover dye anyway but most of it will be absorbed into the fabric...depending on how wet it was originally. Now what? Put the dyed fabric into one of the plastic containers and top it with the lid and set it aside. If you have leftover dye solution in the dishpan, you can just throw it in with the fabric you just dyed, or use it for the next piece, adding more dye solution or plain water, for a very much lighter value. When I am dyeing solids, I just continue this dishpan routine until all the fabric is in the plastic containers and stacked up all over the place. The next day I will wash it all out. If you live someplace warm, the fabric containers can be set out in the sun to 'bake' and then you can do the washout in about four hours. Fill your washing machine with hot water and regular detergent. Wearing your rubber gloves, wring out the individual pieces of fabric, starting with the lightest first. Just get the excess dye wrung out, NO NEED TO ACTUALLY RINSE! Then pop the piece into the hot soapy water. I try to keep like colors together in the washer, so I would do a load of yellows-oranges, and then another of red-fuchsias etc. Of course I am doing 12 yards per washer load, and you may be doing something a lot less. I hate to rinse these pieces, since it is hard to lean over the sink and did I mention that I AM LAZY? If you feel you MUST rinse, before putting the pieces in the washer, then use hottest water to do the rinsing. You will soon tire of that business after you've gotten past your first thousand yards, and will just throw it all into the washer at once as I do. 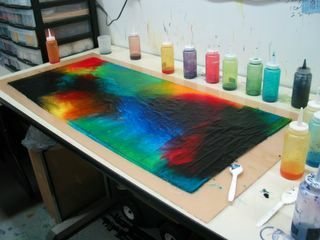 use a plastic table and some plastic sheets and lay out your fabric in the hot sun and pour or drip the dye onto the fabric and have fun making a mess. The sun will dry the fabric in no time and then you are ready to wash it out and use it. When it is dry, it is done. Did I mention salt or urea? Nope. Did I mention Synthrapol? Nope. 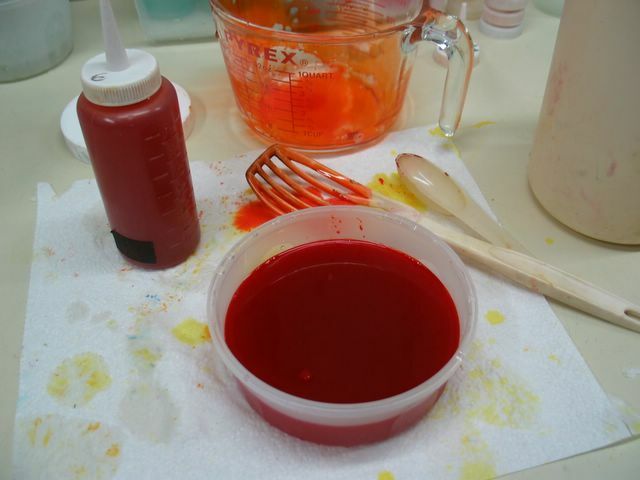 That is thickener and can be used to thicken dye to make specific marks, like lines or dots or squiggles etc. I have used it in the past and may get ambitious and use it in the future...yeah right. Here's my dye system for Special Edition fabrics. 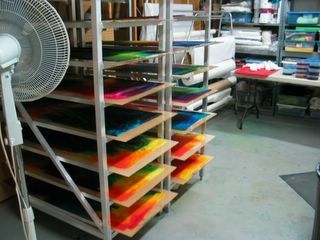 I use sheets of plexiglass 48"x24" and put my half yard pieces on these and put the dye on and let them dry overnight, with the help of big fans. Once the dye is dry the fabric is ready to wash out. The panel with a Special Edition fabric. Note the white plastic spoons on the right. 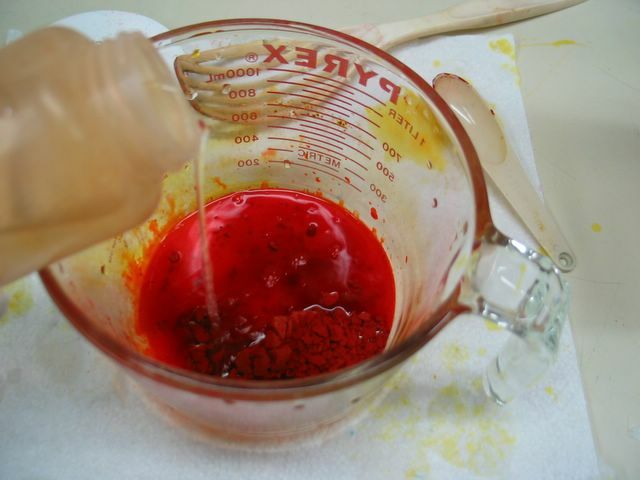 These are used to rub the air bubbles out and spread the dye smoothly. The bottles of dye are from the local beauty supply shop, and have a pretty good fitting cap. Dripping is not good. Freida is a genius and managed to one-up me on her dyerack. These are much much less expensive than my system. Learn from her. The plexiglass sheets are paper backed and we have kept one side of the paper on and removed the other side. Plexiglass can be ordered from a plastics manufacturer in your locale. Use http://www.switchboard.com/ to find several and call them to ask if they will cut to order the right size for your shelves, should you decide to invest... my platters cost $16 each. fabric (in a container) and squeeze the dye through just once, and leave it alone. Adding more water to cover is good, or not... So much of dyeing is experience. The more you dye, the more you learn. Whatever it wants to do is the thing you must accept. My utmost concern was the hardness of water from the workshop site sinks, which I am happy to say passed with flying colors. Then I had concerns about what fabrics we would be using in the workshop (in May), so I ran four tests on each of the four fabrics. I've recorded the results below. Warning, this is really dull reading. Fabrics: Roc-Lon's Nature's Way, James Thompson Bleached Muslin, James Thompson Unbleached Muslin, and Kona PFD. None of these were prewashed. Using 1/4 cup soda ash and one gallon of water as a presoak, and two teaspoons of Deep Orange #6 in 8 oz. of water, I dyed these four fat quarters, using the massage and squeeze technique. This means I poured the dye into a dishpan, and placed the pre-soaked, wrung out fabric into the dye, squeezing the dye into the fabric, wringing it out, squeezing it again, until all the dye is manipulated into the fabrics. Then the dye is completely squeezed out, each fabric is balled up and placed side by side with each other in a plastic container, covered and allowed to sit all night. This prevents any extra dye liquid from creating a darker spot. All washed out nicely, with the Kona taking the dye the lightest and the JT Muslin taking it deepest. The Nature's Way shrank the least, but the JT Muslins had the nicest hand and ironed nicely too. Kona seemed to be almost Perma-Press for ironing. Using 1/4 cup soda ash and one gallon of water as a pre-soak, and two teaspoons of Deep Orange #6 in 8 oz. of water, I dyed these four fat quarters,, I dyed these four fat quarters, using the crackle or scrunchy technique. This means each piece of fabric is crumpled into its own container, and the dye is poured over the surface and allowed to sink down through the wrinkles, in an effort to create textures. Cover the fabrics with dye solution. Do not manipulate the fabric for best results. None of these fabrics showed much texture as you can see in the photo above. Mercerized cottons will show much more texture using the crackle technique. This method created a near solid, making it much more efficient with these particular fabrics, than the massage and squeeze technique. The same fabrics were prewashed and dyed using the Massage and Squeeze technique. No discernible difference was noted in the results. Using 1/4 cup soda ash and one gallon of water as a pre-soak, and one teaspoon of Deep Yellow #4 in 8 oz. of water, one teaspoon of Deep Orange #6 in 8 oz. of water, and one teaspoon of Fire Red #10 in 8 oz. of water, I dyed these four fat quarters, using the Direct Application Technique. Fabrics are pre-soaked, wrung out and pleated lengthwise. Then dyes are poured onto the fabric and allowed to flow together to mix colors where they meet. The fabric is left uncovered overnight. Nature's Way muslin showed the most texture and a good deep color but is very stiff and wrinkly, difficult to press, but the most width. JT Bleached Muslin and Unbleached Muslin showed good deep color, good texture and the finest hand. Kona was washed out looking. Since none of these fabrics are mercerized I expected to find just OK results. I like the James Thompson muslins the best because of their fine tightly woven hand, and their ability to absorb the dyes well and press out easily. However, they are not easy to find and if the the workshop site didn't have them on hand, I wouldn't know where to advise purchasing them. I have used Nature's Way in the past and find it acceptable if it is dried after washing to just damp and pressed out from that point. The Kona, while a favorite of many is such a loose weave that it doesn't take the dyes in the same way as a more densely woven cotton. And being a fuser, I prefer a more dense, less fraying fabric. This is a no comment site. If you have questions or comments Email me. A really good red, from Fire Red #10 with some Deep Orange #6 tossed in for warmth. Dyed on Nature's Way muslin. The yellow-orange ( Cheetos Orange) is Deep Yellow #4, also dyed on Nature's Way muslin. Both results are matte and look kinda suede-y. Half yards. When we moved here I knew I was done with dyeing. No laundry sink was my first clue. But when push comes to shove I found I could make a spot which could possibly work and of course now it has. Here is the one box full of utensils, and containers that will work for solids and scrunchy. The one box of dyes and soda ash. I ordered a few more colors from Dharma, cerulean blue, deep purple, Better Black and Emerald Green. I have used these before and they just work great. So there it is. Two boxes and two tubs, and a big ol' plastic table and I am back to dyeing. When it gets warm I can do the fancy stuff that dries outdoors in the sun. Is there any reason you can't dye somewhere in your house too? These dirty greens were dyed on my new fave fabric, Economy Muslin, not a very glamorous name for this lovely fabric. It is bleached, and mercerized which is really important because it dyes so much better, crisper and deeper. I dyed these pieces using the scrunchy method and I am thrilled at the textured results. This is a close-up of the weave and the next one is just a full on shot. What I like about this stuff besides the price is that it is soft, has a very narrow selvedge, irons beautifully and is so white to start. Everything I need to produce yummy results. The shrinkage is minimal, I lost about a half inch off the half yard I dyed. Which turns out to the exact width of Wonder-Under and these will become fused fabrics, doncha know. The selvedge to selvedge width is 42.75" which is typical. Not quite 44" but still great. To get these dirty greens I used yellows, #1, #2, and #3 plus a small amount of black in the mix. For more on dyeing using black see this blogpost. For pictures of fabrics dyed with black in the mix see this blogpost. This is a no comment site. For questions or comments email me.